In the first entry of this series, we configured Vagrant and VirtualBox to deploy a pair of basic Windows 2012 R2 virtual machines. We built our basic inventory for Ansible and verified we could connect to our newly created virtual machines. Now we can get onto the real work - developing Ansible playbooks. When we run this later, you may get a warning about the use of the runas method if you are using Ansible 2.4 due to this method being experimental. It can safely be ignored. # Powershell 5.0 requires a reboot, so lets get it done if it's needed. This shutdown gives windows plenty of time - 10 minutes to shutdown, 10 minutes to reboot, followed by a 2 minute delay after boot. If you haven't already, save the file. Now we will create the domain controller role playbook and add the common role to it for testing. 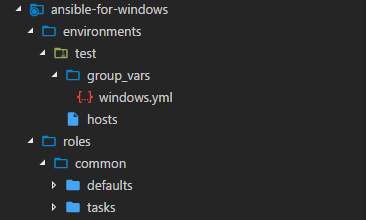 In the top level folder ( C:\source\ansible-for-windows\ ) create a file called domain_controllers.yml. In it, we will tell Ansible to run the playbook against the members of our [domain_controllers] group in inventory and to include the common role. # used for installing Powershell 5.0 in this role. Worked great, but no configuration is ever truly complete, so let's modify our common role to include enabling Remote Desktop Protocol on this host. To do this we will take advantage of Windows Powershell Desired State Configuration, which is very powerful when used in conjunction with Ansible using the win_dsc module. Before we can use a particular DSC module we need to the module available, luckily we can use the win_psmodule to make sure these modules are installed. Name: "Administrator access for RDP (TCP-In)"
Description: "Opens the listener port for RDP"
These steps are pretty straight forward. We make sure the Powershell DSC module we are going to use to configure RDP is available, then use it to enable RDP. However, since the firewall is on by default in Windows Server 2012 R2 we also need to make sure the RDP listener port is open which we used the xNetworking module to take care of. Ansible makes working with Powershell DSC very straight forward, compare the values we're passing to the module with the ones documented for xFirewall. Now with this execution, Ansible will detect that Powershell 5.0 is already installed and since nothing changed in that step we will skip the reboot. It will then go on to make the necessary adjustments to install the missing PowerShell modules and enable RDP. This is an example of Ansible's typically idempotent operation. An operation is idempotent if the result of performing it once is exactly the same as the result of performing it repeatedly without any intervening actions. This style of execution allows us to continue iterating on our roles and repeatedly execute them on the same hosts without ill effects. Try executing the playbook again, you should see all steps coming back as OK or Skipped indicating no changes needed to be made. Execute the playbook one more time to rename the host. Now that we have a fleshed out a set of common tasks, let's move on Part 3 - Creating our domain controller and member server roles.